Want to decorates Your House? Want to Celebrate Your Party in the Explosion of Colorful pattern? Want your wedding to be more romantic? This projector lights as Ideal gift may exceed your imagination. It Creates a festival atmosphere all year round! Brings you an unforgettable fantastic experience. Perfect decorator for: banquets, weddings, family parties, birthday parties, garden trees and pools. 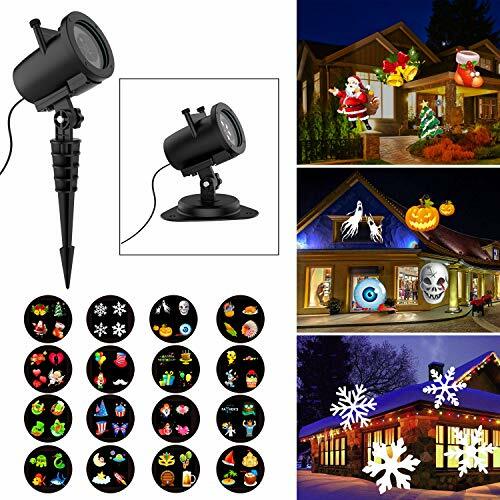 ❤ The 16 changeable patterns projector LED light is available for decorations of different occasions and festivals. ❤Healthy soft LED light, protect your eyes, good night light for baby. ❤Wireless Control: The controller is simple to use and you don't even need to step outside. ❤Weather-resistance: It has a weather-resistant cap to help protect the connection from the weather. Add to Cart now, you will get a great projector lights! ★Multi-Operating Modes - There is a switch button at the bottom of the host, press the switch to change mode:ON/OFF, Flash (+,-), Speed (+,-), Fixed. Automatic timer which built in daily 6-hour on, 18-hour off cycle. ★More Brightness and Clarity - interchangeable Fun Colorful projection images instead of black or white images; Gentle soft led light, better to protect eyes especially for kids and enjoy your day. If you have any questions about this product by Lighting Store Diret, contact us by completing and submitting the form below. If you are looking for a specif part number, please include it with your message.